WELCOME TO THE HOME PAGE OF GILA TROUT CHAPTER # 530 OF TROUT UNLIMITED, LOCATED IN PAYSON, ARIZONA. OUR CHAPTER WAS STARTED IN 2009 AND HAS ABOUT 55 MEMBERS AT PRESENT. WE ARE LOCATED AT ABOUT 5000 FOOT ELEVATION IN NORTH EAST ARIZONA, WITH LOCAL ACCESS TO ABOUT 15 TROUT STREAMS IN OUR IMMEDIATE AREA. TROUT UNLIMITED NATIONAL, STATE COUNCILS, AND ALL CHAPTERS ARE NON PROFIT 501C3 ORGANIZATIONS, AND ALL DONATIONS TO THESE ORGANIZATIONS ARE TAX DEDUCTABLE UNDER IRS REGULATIONS. OUR CHAPTER FULLY SUPPORTS ALL EFFORTS TO RETURN NATIVE GILA AND APACHE TROUT TO APPROPIATE STREAMS IN ARIZONA. HOWEVER WE ALSO SUPPORT OTHER COLD WATER SPORT FISHERIES IN ARIZONA, BE THEY NATIVE OR STOCKED SPECIES. Below is a link to policy adopted by AZ State Council and Chapters re: native and wild trout in Arizona. Click on photos of trout below for more information on the species. THIS IS A PHOTO OF NATIVE GILA TROUT NATIVE ONLY TO ARIZONA AND WESTERN NEW MEXICO, WHICH WAS NATIVE TO OUR LOCAL STREAMS 100 YEARS AGO, PRIOR TO STOCKING OF NON NATIVE TROUT SPECIES IN ARIZONA.BOTH GILA AND APACHE TROUT WERE LISTED AS ENDANGERED AND NOW AS THREATNED. THIS IS A PHOTO OF A NATIVE ARIZONA APACHE TROUT THAT IS ONLY FOUND IN ARIZONA AND IS A CLOSE RELATIVE OF THE GILA TROUT. 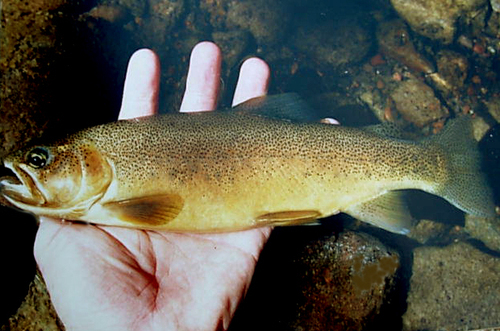 tHE APACHE TROUT ARE FOUND IN THE WHITE MOUNTAINS IN ARIZONA AND ARE A CATCHABLE SPECIES THERE.